I realize that its been a while since I've posted an update. I have been working on several projects, and some of them are nearing presentability. I did want to let you in on my plans for the next few months and also ask your opinion on something as well. I am currently putting the finishing touches on the second segment of "Judgment Cove". I'm really excited about the way its turning out. 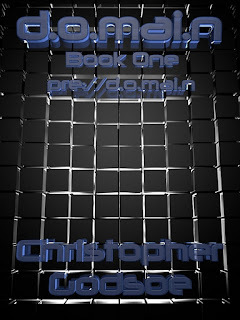 Once the revisions are complete and I've updated the cover, the next thinng up is Aztlan. I am over halfway through my revisions, but I stepped away from it for a time because I felt it was missing something and I wanted to allow it t come to me. I plan to make an audiobook version as well, and to record again the audiobook version of "Where I can't follow". I will then write the final installment of "Judgment Cove" and make the final cover. At that time I will be releasing my retail store. No, the items on there are not t-shirts with my face on them or anything. The main reason for the store is to sell the audiobook versions of my short stories, but I will also be making other items that tie into some of my stories that I think will be acceptable. Then I will repackage "Judgement Cove" as an ebook and audiobook as well. I haven't decided yet to make an anthology of short stories yet or wait.until I have a few more, but I have time to decide that. At that point it will likely be the end of August, and I plan to take the already started manuscript for "pre://d.o.mai.n/theSagaof/MilesTorvalds", shut myself in my families camp for a week, and really take a big bite out of the outline of my first full length novel in the style of Henry David Thoreau. The goal is to finish up the first draft during my week at the lake, but then I have a dilemma, which brings me to my question. Should I send out my novel to prospective agents, or should I just self publish and take the promotional reigns myself? Please let me know what you think, and as always thank you for taking the time to check out my site.